and the GTA since 1989. As chiropractors in Mississauga, we get to help people who suffer from a variety of health issues. Naturally, chiropractors help traditional back and neck problems, but chiropractic has also produced wonderful results with a variety of other health problems. Newborns, seniors and everyone in between can benefit. Chiropractors are increasingly being consulted for health problems beyond neck and back pain. As a safe, conservative approach, chiropractic is a natural solution that relies on your body’s ability to heal itself—if there isn’t any interference. Learn more about us as chiropractors here. We’d like to meet with you in our Mississauga chiropractic practice and discuss your health issue. If you’re a good candidate for chiropractic care, we’ll conduct a thorough examination. We’ll explain what we found, suggest a care plan and monitor your results. Hear our ads on wdcxfm! 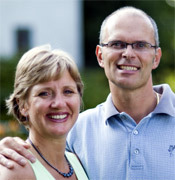 Would you like Dr. Mark and Denise to speak to your workplace, social group or church group on health and wellness? Just call (905) 820-5660 for more information or to schedule a time!